Why did the Chicago Bears draft Mitch Trubisky? Well most believe the big reasons are obvious enough. He’s a really good football player, first and foremost. An athletic young man with a strong right arm, pocket poise and accurate passes. Those are some of the essentials that make great NFL quarterbacks. However, to take him with the #2 overall pick? After trading up no less? It had to take more than just that. Personality, work ethic and leadership are critical as well. GM Ryan Pace understands that better than most. He had a front row seat to watch the likes of Tony Romo in college and later Drew Brees with the New Orleans Saints. His job was to find any and all ways possible to discover if Trubisky was made of the same stuff. So according to Dan Wiederer of the Chicago Tribune, he hatched a harmless little plan to find out. Oddly enough, it would have nothing to do with how Trubisky acted on the field or in the locker room. The Bears draft Mitch Trubisky because of a dinner reservation? Instead it would come through a simple request. He’d ask the young QB to make the reservations for their dinner meeting at Chapel Hill in North Carolina with a couple stipulations. Not only did Trubisky follow through on his end of the bargain without a hitch, he did so with a little dramatic flair. Something that still has many in the team brass smiling. “As Pace does with all such get-to-know-you dinners, he asked Trubisky to pick the restaurant and make the reservation. It’s a minor request. But it often can be revealing of a player’s reliability. Making the reservation without issue itself would’ve been fine. To invoke the name of the only quarterback in Bears history to win a Super Bowl? That’s a nice touch. It’s also indicative of a young man who takes the game seriously and knows his history. Remember that Trubisky is an Ohio native. 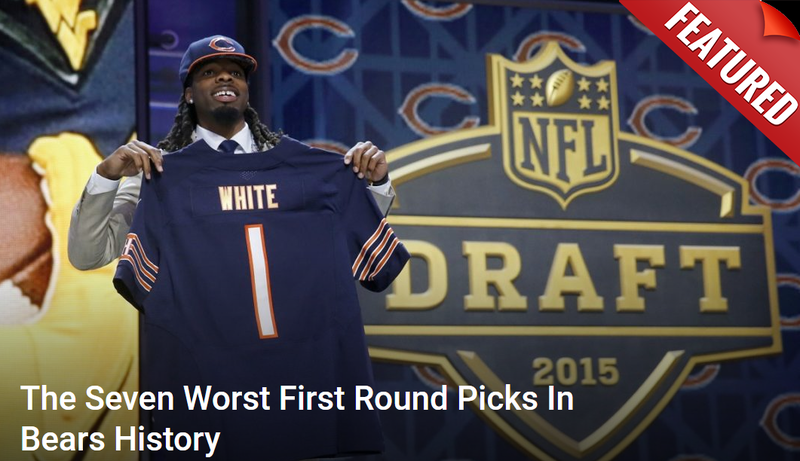 He didn’t grow up a Bears fan. However, he’s stated on multiple occasions that Walter Payton was his favorite player thanks to books he read. It’s almost a guarantee that Jim McMahon would’ve been mentioned a few times in those books. Not to mention in the numerous clips of those great Bears teams of the 1980s. The fact Trubisky also used the name of a man who was the last quarterback taken in the top five by Chicago completed the picture. It was a wink-wink, nudge-nudge sort of moment. An inside joke that was also a hint. Just really good stuff. The Bears have always been an organization that prides itself on tradition. No team is more revered and remembered to this day than the 1985 group. McMahon was at their head, reshaping the vision the stoic NFL had at the time of what champions are supposed to look like. He helped make football fun again in Chicago. Through simple acts like this Pace became convinced that Trubisky can do the same. So when given the chance, he didn’t hesitate. The Bears moved up, got their guy and are ready to build a bright future with him. If it all works out, that meeting at Bin 54 will become a treasured part of Chicago football lore.